In the business world, recent years have seen a growing acknowledgement of the value of intangible assets rather than physical assets. This has precipitated a crisis in the accounting industry: the accounting representations relied upon for years can no longer be taken for granted. Here, Norman Macintosh argues that we now need to understand accounting in a different manner. 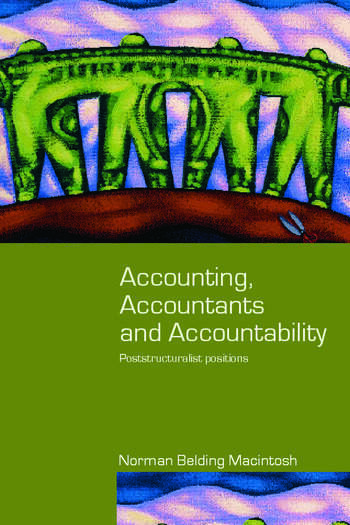 Offering several different ways of looking at accounting and accountants, he draws upon the work of eminent thinkers such as Barthes, Baudrillard, Derrida, Foucault, Lyotard and Bahktin. In doing this, he develops revolutionary insights into the nature of accounting, pioneering the introduction of contemporary poststructuralist ideas into accounting theory and practice. With a wide range of examples and case studies and now available in paperback for the first time, this revolutionary new work will be essential reading for academic and professional accountants along with all those with an interest in the future of accounting.